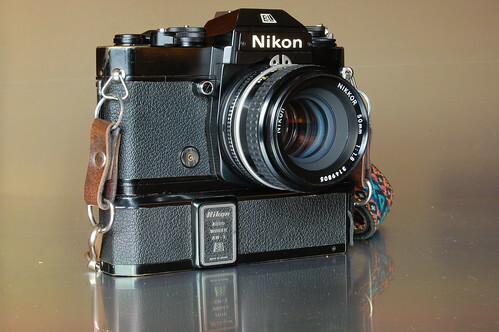 The Nikon EL2 is an aperture-priority automatic exposure 35mm SLR, replacing the Nikomat/Nikkormat ELW. It has SPD metering cells, 8 second slow shutter speed, AI coupling, etc. It runs off a PX28 battery, and still uses the AW-1 winder. At least, it finally is equipped with a modern FPC board. It was replaced by the Nikon FE. First of a series of pages on the Nikon EL2 at the Nikkormat site within "A Pictorial History of Nikon Cameras"
This page was last edited on 24 February 2013, at 01:24.